Habit: Nashia inaguensis grows as a shrub/small tree up to 3 m in height. The leaves are arranged oppositely and are up to 3 cm long. The leaves are ovate to elliptic in shape with a revolute leaf margin and the apex is acuminate. The stems and leaves are covered with small hairs. The zygomorphic, complete, perfect flowers are arranged in axillary heads.. The calyx is reduced to a single pubescent, bract like structure. The corolla has 4 fused, white petals. There are 4 stamens fused to the corolla. The ovary is superior with two locules. The fruit is an orange drupe. Habitat: Nashia inaguensis grows in Dry Broadleaf Evergreen Formation – Shrubland/Dwarf Shrublands. Distribution in Bahamas/Globally: Nashia inaguensis occurs in the southern Bahamian Archipelago (Great Inagua) as well as Puerto Rico and the Virgin Islands. 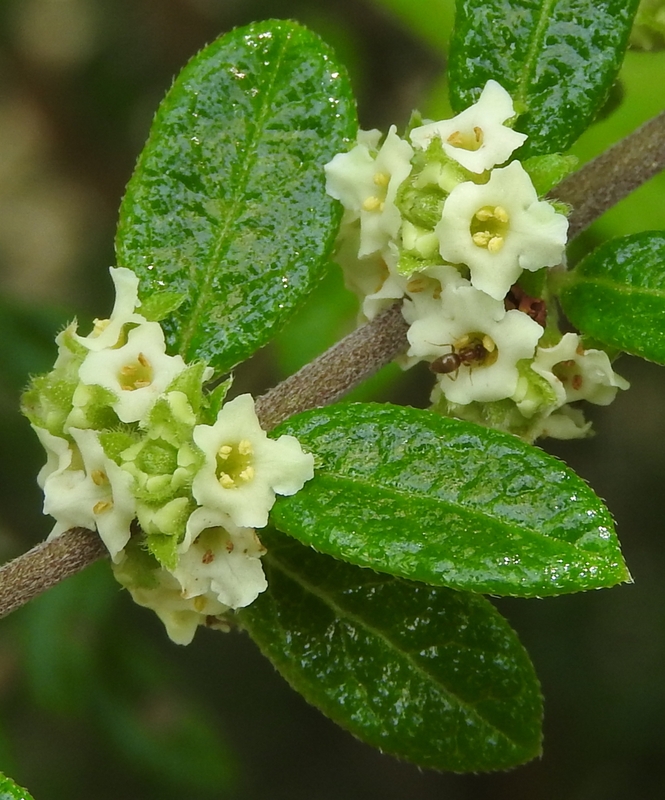 Medicinal/Cultural/Economic usage:	Nashia inaguensis is not known to be used medicinally in the Bahamian Archipelago. It is now in the horticultural trade in south Florida and throughout the Caribbean.